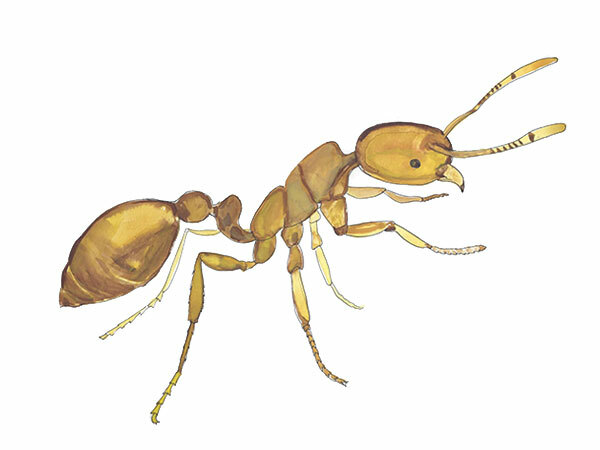 The thief ant is very small, ranging between 0.5-3 mm long. In fact, the thief ant is so tiny they can invade homes and contaminate food undetected. Their color is yellow to light brown and their eyes are very small. The pharaoh ant and the thief ant are often mistaken for each other because of the similarity in color and size. Thief ants are native to the Florida and other parts of the United States. These ants earned their name because they build their nests near other ant colonies in order to easily steal larva and food. Thief ants are extremely adaptable and, because they are so small, they can build nests almost anywhere. Outside they will nest in the soil, but they prefer to nest under objects such as dead branches, bricks, rocks or mulch. When thief ants nest inside homes, they prefer tight places such as baseboards, wall voids or between small cracks and crevices around the home. Thief ants commonly enter homes during the warmer months of the year. They can also be found trailing on the exterior of homes as they enter the structure. Thief ant colonies are relatively small compared to other species. One colony may consist of several hundred to several thousand workers and multiple queens. Reproductive swarming usually occurs between July and October. A queen thief ant can lay as many as 400 eggs per day. Their offspring develop into adults in just under 50 days. Thief ants are also known as grease ants because of their preference for high-protein diets such as insects, meats, cheese and other dairy products. Thief ants have a strong appetite for larva or eggs. They are notorious for building nests next to competing ant colonies to rob them of their larva and food. Unlike many ant species, thief ants are not attracted to sweets but are known to occasionally eat certain fruits. Thief ants are incredibly small and, because of their size, it can be tough to locate the nest. Thief ant control is also difficult because they are not attracted to most bait traps. Residual insecticide treatments are easy if the nest is located. Follow ant trails if attempting to locate the nest. If the nest is located behind a tight location, use an aerosol insecticide spray with an extension tube. Follow up with an exterior perimeter spray. Baiting can also produce successful results if the correct bait is used and kept fresh. Protein bait is recommended due to the thief ants appetite for protein-based foods. Frequently check on the bait to ensure it is fresh and eaten by the colony. Warning: Pesticide is poisonous and should be handled by a pest control professional. Always read the label and follow instructions before use. We provide assistance to your neighborhood, including ant control Sarasota, ant control Siesta Key, ant control Longboat Key and surrounding areas. Cloud Termite and Pest Control is available to answer any questions you may have about ants and ant control in your home.